The Art of Script Editing provides a comprehensive overview of this vital role, examining its responsibilities and functions during all stages of the development process, both in film and television. Detailing the nuts and bolts of the job, it looks at what’s required and expected, how script editors assess a script, their approach to working with writers and producers, and their input during rewrites and pre-production, and up to a project’s completion. It also examines the ways in which writers and producers can benefit from working with a professional script editor as they seek to refine and communicate their vision. 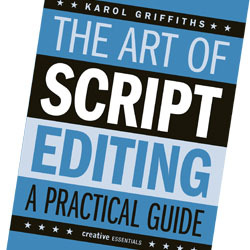 The Art of Script Editing; A Practical Guide is a valuable resource for anyone developing a script no matter where they are in the process, for writers and producers interested in expanding their understanding of how a script is advanced, and for those pursuing a career in script development.